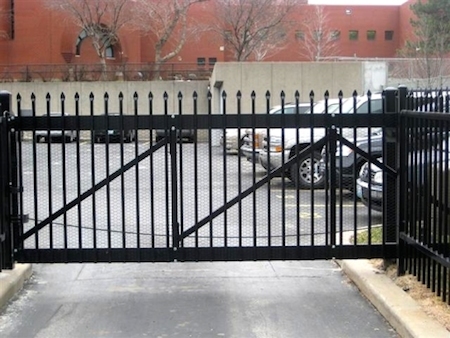 Automated cantilever gates are one of our specialties. These gates help in situations where a track to guide and automated gate isn’t practical. 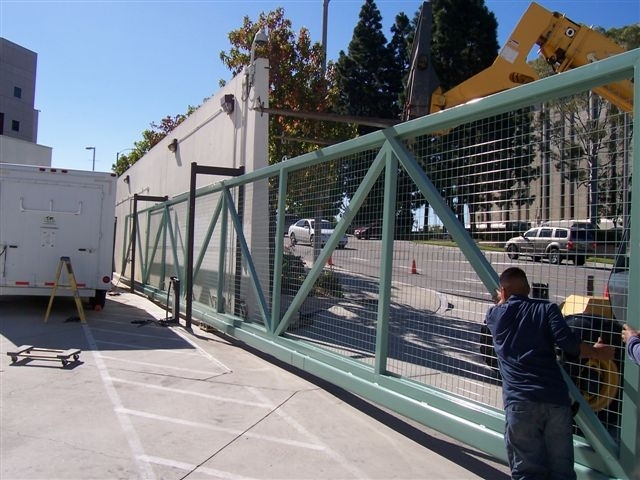 CDC has the experience and equipment to make cantilever gates to secure opening up to 115’ wide. The photo of the green gate is 75' long and 9' high. It uses no ground track to guide it. 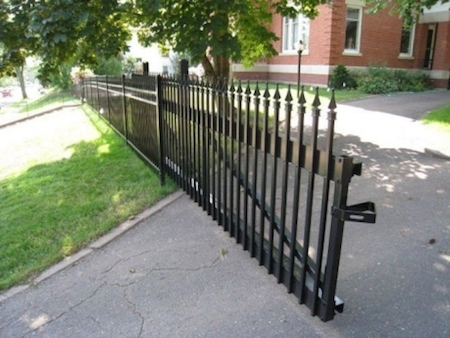 This is a super rigid custom cantilever gate that weighs over two tons. It secures an opening 50' wide to allow authorized trucks to come and go. This kind of gate cannot be installed by just anyone, it requires special engineering and experience to install a massive gate like this. The other example photos of Cantilever gates are lighter weight aluminum designs appropriate for smaller openings for driveway entrance security for cars and people, areas where a simple barrier gate is not sufficient. 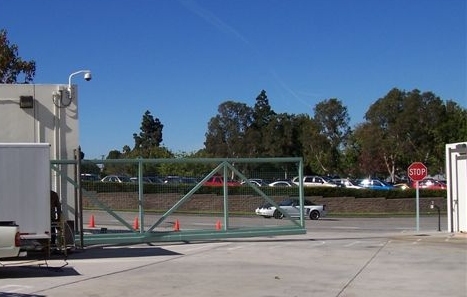 Cantilever gates incorporate motorized operation with special sensing capability to operate in a safe method in case anyone were to get in the way, hitting an object or person. The sensors are very important to minimize the risk of injury or damage. To construct the example green gate CDC had to use special gate hardware materials, available only from Italy, shown in the picture to the right. Massive rollers arrays to hold extremely high stress are needed. This hardware is uniquely built and tested to support a cantilever gate this heavy for a distance of 50'. Anchoring the roller points was done in a super foundation, adequate to suspend the gate this heavy at such a long distance. Accuracy in construction and installation is paramount for the operation and long term durability of cantilever style trackless gates. At Commercial Door Company we can manufacture and/or install gates like these examples shown, anywhere in So. California. Call us today to discuss your gate security requirements.